As we head into Week 2 of Eat Local Month, the question gets raised of how local should we be? Personally, I’m a big believer in the perfect being the enemy of the good. In other words, even though it’s nearly impossible for every meal to be made up entirely local ingredients, there’s no reason why we shouldn’t aim for a majority. Last I checked, tea, coffee, soy sauce and cinnamon were not produced or grown anywhere near Nevada County, but you’ll have to pry them out of my cold, dead hands. This week’s recipe is a great example of a mostly local dish: the onion, green beans and garlic can all be sourced right here. The oyster sauce, not so much, but it tastes great and I don’t want to give it up. Plus, that’s a 75% local ingredient rate – which isn’t too shabby. This recipe will also take advantage of all the runner beans that are going nuts right now. It scales up easily and the leftovers taste great. It also cooks up in a flash once everything is prepared. Since this is an Chinese dish, we should take a quick look at Chinese cooking techniques. The Chinese have given us stir-frying, for which I am immensely grateful. It’s a style of cooking developed by people who are on the move; so it requires little fuel, one pot and goes very quickly. Because stir-frying is such a fast way to cook, you really need all your ingredients ready and at hand before turning on the heat. There won’t be time to chop garlic while the onion cooks, so don’t even try. When stir-frying, the wok should be hot before adding the oil. This reduces the cooking time, since you don’t have to wait for the oil to heat and keeps you from adding the food too early. If there isn’t a wok in your kitchen don’t worry – any large frying pan will work, just make sure it has a tight-fitting lid. The food should all be more or less the same size. Two inches is a good standard size to aim for. The length of your thumb is also a good metric. Finally make sure the heat is high, high, high. If you have an electric burner, it should be glowing. Gas should be cranked all the way up. This is not a delicate method of cooking – which is partly why I like it so much. To start, spread out all your green beans and take a minute to look for any funkiness that might be going on. Funkiness in kitchen terms is anything wet and/or alive. Weirdness is dry and/or dead. Toss out any green beans that are looking odd and cut the rest into two-inch pieces. Wash and dry them in a salad spinner or a colander. Heat the wok, then add the oil, followed by the onions. Stir fry the onion for a minute or two to soften and season the oil. Add the garlic and stir fry for another thirty seconds or so, being carful not to burn the garlic. Brown is ok, black is not. After that, add the green beans. In Asian cooking, vegetables are never cooked until they are limp. Everything is served slightly crisp. If you want your vegetables cooked until they are soft, no one will stop you, but fresh green beans just this side of raw are wonderful and I encourage everyone to try them at least once. 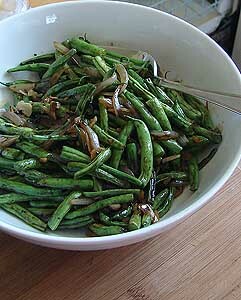 Toss the green beans with the onion and garlic, then add a tablespoon or so of water and cover to steam. That sounds like a small amount of water – and it is – but this is a steamed dish, not a boiled one. Check the beans after a couple minutes, if they look dry, add a little more water. If they have a slight bit of char, that’s perfectly fine. After the beans have steamed, add the oyster sauce to the wok and stir to coat. A little of this stuff goes a long way and one bottle will last for quite awhile. It can be found in most grocery stores near the soy sauce and other Asian ingredients. This dish is a great side dish with some grilled marinated flank steak. Or tofu can be added in for a vegetarian meal with protein. If green beans aren’t your speed, try sliced zucchini, broccoli or a mix of whatever is taking over your garden at the moment. No matter what, keep in mind that eating local should be fun and tasty. And it’s perfectly ok to keep doing it after August, too. 1. Trim both ends of green beans. Cut green beans into 2 inch lengths, wash, and spin dry or dry with paper towels. 2. Heat the wok or a heavy frying pan over high heat for 1-2 minutes, until it’s too hot to hold your hand over it. Add the oil and heat about 30 seconds more, then add the garlic and onion. Cook for 20-30 seconds, stirring the whole time. 3. Add beans and salt and cook about 2 minutes, stirring several times. Then add water, cover wok, and let the beans steam for 5 minutes. Check at the two minute mark and add more water if needed. 4. Uncover the pan and add oyster sauce, then cook 2 minutes more, stirring so all the beans are covered with the sauce. Beans should still be slightly crisp when they’re done. Serve hot.